Be the first to share your favorite memory, photo or story of Esta. This memorial page is dedicated for family, friends and future generations to celebrate the life of their loved one. 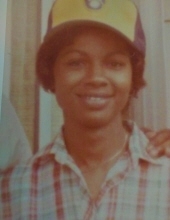 Esta Mae Madden was born January 27, 1937 to Callie Washington and Eli Hart, in Marianna, Arkansas. She was born in the middle of 8 siblings, and moved to Denver, CO. when she was a young girl. She attended Gilpin Elementary and Cole Middle schools. As was the custom at the time, older children took care of younger ones while parents worked. Her mother entrusted her with caretaking duties for her younger siblings, so she gained a sense of responsibility at an early age. While attending Manual High School, she also worked at Selman's Record's, a popular music store on the Five Points at the time. Esta was a beautiful girl, catching the eye of an airman she met while working at the record shop. His name was George L. Madden, who she married shortly thereafter. They were first stationed in Rome, NY, and had their first two children, Steven and Cherie. Another of many moves brought them back to Denver, where their third child, Michael, was born. Esta became a military wife and doting stay-at-home mom to three babies, focusing on her new family,and experiencing all of the high and lows that came with a mobile military life. In 1958, they moved to Germany in 1958, but travelled separately, which must have been mind-blowingly adventurous considering she had 3 children under 6 and how young she was. Their fourth child, Kathy was born during their first of two stints in Germany. After returning to the states, they traveled all over the country, settling back in Colorado in the 70s. Mom was happy to be back closer to her family, but missed traveling, so they took cruises, vacations with their kids, became avid campers and thoroughly enjoyed their retirement. Most weekends in their later years you could find them at some campsite in Colorado, still enjoying the outdoors and each other. Just as she was the caregiver for her younger siblings growing up, she became caregiver for her beloved mother, sister and sister-in-law. She liked to read, crochet and knit. Gardening was her passion, and our annual Mothers Day trips to Nick's with my sister was a long-standing tradition. She and my dad had a long and fulfilling life together, traveling all over the world and exposing their kids to various places and cultures. They remained married for 63 years, until his passing in 2017. She is survived by 3 siblings; Horace Hart, Alonzo Washington, and Elizabeth Blanchard, four children; Steven, Cherie, Michael and Kathy, 4 grandchildren; Cassidy, Dakota, Isaiah and Cotter, and 2 great-grandchildren; Niaobi and Malayah. To send flowers or a remembrance gift to the family of Esta Mae Madden, please visit our Tribute Store. "Email Address" would like to share the life celebration of Esta Mae Madden. Click on the "link" to go to share a favorite memory or leave a condolence message for the family.